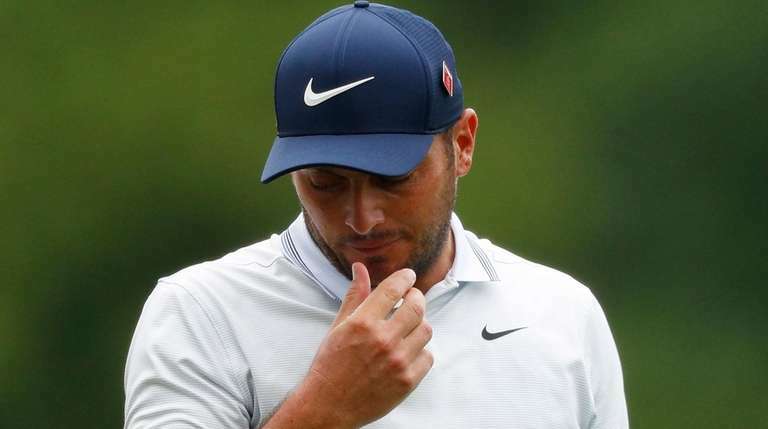 AUGUSTA, Ga. — Francesco Molinari wouldn’t have minded a bogey. In fact, he said that after playing 49 holes in a row at this Masters without making one, he was waiting for it to happen. The run ended at the 12th hole on Sunday, the devilish par-3 over Rae’s Creek, but with a double bogey, not a bogey, dropping Molinari from the lead he had held since the front nine Saturday and into a tie with Tiger Woods. And then his chances ended with another double bogey at 15. So the British Open champion who seemed comfortably ahead, who kept holing 6- and 7-footers for pars early on, shot a 74 and came in at 11-under-par 277, two behind Woods and tied for fifth. Molinari, playing with Woods and Tony Finau, described his mistakes — a ball into Rae’s Creek on the 12th, where so many Masters dreams have been doused, and then a ball into the pond at 15 — as mental lapses. The decision was at 15, the 530-yard par-5 with a pond in front. Most players go for the green in two, but Molinari elected to lay up and did so too far to the left. His pitch shot clipped a tree and splashed into the water, leading to the second double bogey. “If it doesn’t clip the branch,” he said with a sigh, “it might go close to the hole, but I probably should have gone to the middle of the green and waited for the last three holes to make something happen. Molinari proved how calm he was last year when he won the British Open while playing with Woods in the final group. Tiger Woods wins Masters for his first major since 2008Fourteen years after he last earned a green jacket and two years after he wore it while telling fellow champions that he probably never would play competitive golf again, Tiger Woods achieved a new peak in his remarkable career.